Welcome to Wine Quiz number 20. Choose from the list of possible answers to each question. Your score will be displayed automatically at the end, and just below the leaderboard, click “View Questions” to see all the correct answers. Enjoy the quiz? Please sign up to my newsletter and we’ll keep you up to date with the latest news from wine-pages, including all new quizzes. No spam guarantee! 1: ‘Vin Gris’ is what colour? Vin Gris – literally ‘grey wine’, is not grey, but a rosé wine which is normally a very pale pink, though can be a deeper pink. 2: Where in Italy is Friuli wine region? Friuli is in north-east Italy, north of Venice and running right to the border with Slovenia. It is mostly famous for white wines. 3: Spain’s sparkling wine CAVA can only be produced in Penedes, just west of Barcelona. Though the bulk of Cava does come from Penedes, in fact it can be made in many Spanish regions, including Rioja and Navarra. Though the bulk of Cava does come from Penedes, it can be made in many Spanish regions, including Rioja and Navarra. 4: What is or are ‘Qvevri’? Qvevri are clay pots buried underground, used to ferment and age wine. Historically this was done in the country of Georgia, but such pots are increasingly being used by artisan winemakers around the world. 5: Mousseux and Blanquette wines are…. These terms, along with Crémant, are used by various French regions for sparkling wines. 7: Portugal’s Aragonez is a synonym for which great grape of Rioja? Tempranillo goes by many names: it’s also called Tinta Roriz in Portugual and Tinta de Toro in Spain for example. 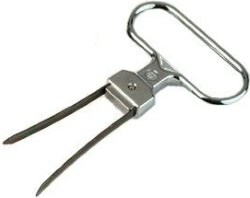 8: This ingenious device is commonly known by what name? The ‘Butler’s thief’ allows you to remove the cork from a bottle by wiggling the levers down the side of the cork and twisting it out – no corkscrew required. 9: Which wine region suffered extensive wildfire damage in autumn 2017? Napa and other regions of California’s wine country suffered from wildfires in early October, that also claimed over 40 lives, and more fires broke out in December. 10: What is the name of the winery owned by President (at time of writing) Donald J Trump? Controversy surrounds who actually owns Trump winery, its own website claiming it is Donald Trump’s son, Eric, whilst The Trump Organisation lists it as an owned asset. 11: To be ‘Grand Cru’ a Champagne vineyard has to be in a village rated as how many points out of 100? A system known as Échelle des Crus rates ever village in Champagne, and vineyards wihin 100-point villages are classified as Grand Cru. Coravin is a market-leading device for preserving wine by withdrawing wine through a hollow needle, but not removing the cork. 13: The Rutherglen region of Australia is most famous for what style of wine? Rutherglen is home of superb fortified Muscats and ‘Tokays’, especially aged wines – some wines more than 100 years old. 'Chaptalisation' refers to the practice of adding (sugar, sucrose, syrup, cane sugar, beet sugar) to enrich a wine. Invented by Jean-Antoine-Claude Chaptal, in this process sugar is added to the must before fermentation, not to sweeten it, but to boost the eventual alcohol level post-fermentation. 15: What – if anything – is wrong with this bottle? There is nothing wrong here: Musigny is a Grand Cru of Burgundy, which can be red or white in a bottle this shape, and Musigny was made in 1990. 16: What’s the odd one out, geographically? Bandol is in Provence, the others are hundreds of kilometres away, in southwest France. 17: Traditionally, which would be the perfect vessel to enjoy a glass of Petite Champagne? 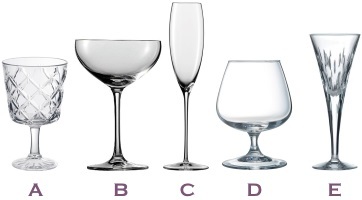 Petite Champagne is in fact a Cognac, not a wine, so glass D is the perfect shape. 18: Which of these vine training systems does not support the vine on wires? Gobolet, or ‘Bush Vines’, grow as a low bush with no supporting wires. Tras-os-Montes in Portugal, means ‘Beyond the Mountains’, Kakheti is the main wine region of Georgia, Eger makes Hungary’s famous ‘Bull’s Blood’, Serra Gaúcha is Brazil’s main wine region and Emporada is in northeast Spain. 20: How does the Ancestral Method of making sparkling wine differ from the Champagne, or Traditional Method? In the Ancestral Method partially fermented wine is placed in individual bottles, but without any added yeast or sugar as in the Traditional Method. The other big difference is that Ancestral Method wines are not disgorged, so may be lightly cloudy.